A new stem cell therapy is now available to eye patients using subretinal placement of adult stem cells. Patients with more severe eye problems may now have the opportunity to improve their sight and gain useful vision. This is the first time adult stem cells have been placed directly beneath the intact human retina as a treatment for eye disease. Dr Steven Levy is pleased to announce that The XCell-Center in Germany has begun a new treatment for eye patients using subretinal placement of adult stem cells for ophthalmic disease. 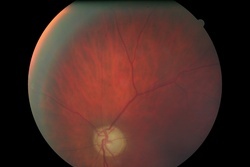 Initial patients included an individual with Stargardts Disease, a type of hereditary retinopathy, and a patient with Age Related Macular Degeneration or AMD. “To our knowledge this is the first time adult stem cells have been placed directly beneath the intact human retina as a treatment for eye disease ” stated Dr. Steven Levy, President of The Acoma Group LLC and consultant for the XCell-Center. “Stem cells may now be introduced very precisely into specific locations of the retina where ophthalmic disease has destroyed photoreceptors or retinal pigment epithelial cells. Very tiny areas such as the macula can be treated precisely using extremely small custom catheters” he explained. Dr. Levy indicated that adult stem cells may now be seeded into the subretinal space for hereditary retinopathies or around the optic nerve so they may enter the nerve directly. “ Although the XCell-Center continues to have excellent success improving the vision of many patients with retrobulbar adult stem cells, some referring ophthalmologists have asked if it might be more effective to place the stem cells directly beneath the retina in certain conditions- as has typically been done in preclinical studies in animal models, ” indicated Dr. Levy. “ That option is now available exclusively for patients at the XCell-Center which is the first and only stem cell facility in the world to offer this unique treatment option”. The Xcell-Center has made a substantial investment in the most up-to-date surgical instrumentation for this new procedure. Initially this procedure will be available for ophthalmology patients who have poor vision with no abnormal blood vessel growth in the eye receiving subretinal treatment. For the time being only one of the patient's eyes will receive subretinal stem cells with the fellow eye having the standard retrobulbar stem cell treatment. The XCell-Center will offer subretinal stem cell treatment to patients with a wide variety of eye diseases including Age Related Macular Degeneration ( AMD) of the dry or geographic form, Myopic Macular Degeneration, Presumed Ocular Histoplasmosis Syndrome (POHS), Chronic Central Serous Retinopathy (CSCR); Hereditary Retinopathies including Retinitis Pigmentosa, Stargardts, Cone-Rod Dystrophy; Optic Nerve Disease including Glaucoma, Ischemic Optic Neuropathy and Optic Nerve Injuries. Wet macular degeneration patients may also be considered for treatment if subretinal neovascularization has been absent for at least 6 months. “ The XCell-Center will maintain an open policy regarding subretinal stem cell treatment as they simply don't know what eye problems will potentially benefit. Patients with less common eye diseases may be eligible for subretinal stem cell treatment and will be evaluated on an individual basis by the ophthalmologists at XCell ” explained Dr. Levy. The XCell Center in Germany is a leading provider of adult stem cell therapy for many acute and chronic diseases in adults and children. Patients from the United States, Europe and throughout the world currently travel to Dusseldorf and Cologne to obtain sophisticated treatment that is unavailable in their own countries. “The XCell-Center believes that subretinal placement of adult stem cells may provide greater visual improvement for patients suffering from a wide variety of eye diseases” says Dr Levy. “ We're entering a truly exciting time in regenerative medicine where adult stem cells are reversing many disease processes and repairing damaged tissue successfully”. The XCell-Center and Macular Degeneration Medical Intake FormMedical Information Form for interested eye patients to fill out and email.